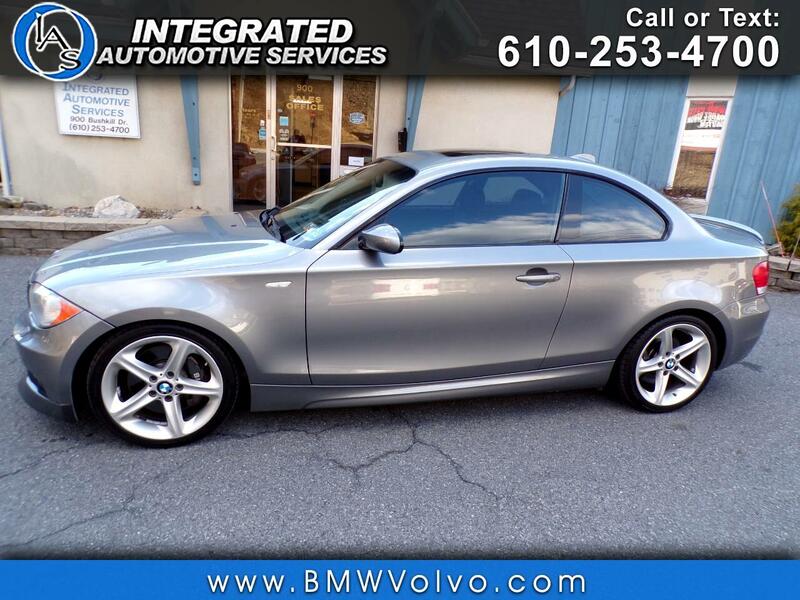 Used 2009 BMW 1-Series 135i for Sale in Easton PA 18042 Integrated Automotive Services Inc. Recent Arrival! Fresh Oil Change, New PA State Inspection, Fully Serviced, Clean Carfax, Non Smoker, 18" Star Spoke Cast Alloy (Style 264) Wheels, 3-Stage Heated Front Seats, 4-Way Adj. Power Lumbar Support For Front Seats, Ambient Light Package, Anthracite Headliner, Auto-Dimming Mirrors, Auto-Dimming Rear-View Mirror, BMW Assist with Bluetooth® Wireless Technology, Boston Leather Upholstery, Cold Weather Package, Cupholders, Digital Compass Mirror, Increased Top Speed Limiter, Integrated 3-Button Universal Garage Door Opener, M Sport Package, M Steering Wheel, Navigation System, Power Adjustable Folding Auto-Dimming Exterior Mirrors, Power moonroof, Premium Package, Real Time Traffic Information, Shadowline Trim, Ski Bag, Sport Package w/ZMP, Voice Command System. We sell our cars serviced and inspected. Each one gets a new PA state inspection sticker and we include a 3 month or 3,000 mile powertrain warranty. We also offer many options in extended service plans. Bank financing is available and we also take trade ins. Check us out on Google and see what some of our many other previous customers have to say about us. For over 27 years, IAS has been selling high quality pre-owned imports at affordable prices. Visit us today and see how easy we can make your next car purchase. Celebrating over 27 years in business!! At IAS, we are persistently using honesty in an industry with a deceptive stigma. We have a passion for pre-loved vehicles and maintaining their liveliness. We would love for you to visit us on our website www.bmwvolvo.com or at our location in Easton! We'd be happy to give you more information on the vehicles or schedule a test drive. Our helpful staff is just a phone call away 610-253-4700. Hope to see you soon! Message: Thought you might be interested in this 2009 BMW 1-Series.